When the holiday season rolls around, it’s easy to get caught up in the hype of giving and receiving gifts. After all, that tradition probably makes Christmas one of the most expensive holidays. This time of year is also the perfect time to give thanks and show gratitude. Leading with the theme of Thanksgiving, it’s important to be thankful for your current situation no matter what it is, and be willing to give back to those who are less fortunate than you. Giving back feels great, and it helps others. 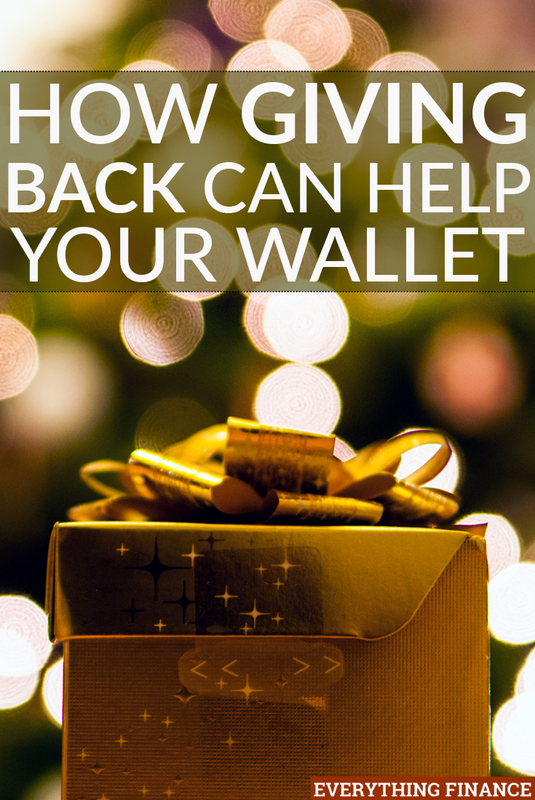 Plus, you don’t even have to spend much money, and giving back can actually help your wallet. Volunteering can be a great hobby, especially around the holidays if you’re looking to stay busy. I used to get caught up in looking at various different sales and discounts for items I didn’t really like or need just because everyone else was shopping, and I had major FOMO (fear of missing out). If shopping gets old quickly for you, and you’re not interested in activities that cause you to spend a ton of money, consider volunteering at an event or with an organization you care about. It will feel great to make a difference in someone else’s life and connect with people who have similar values as you. Plus, volunteers tend to get some freebies throughout the day like breakfast or lunch, free products and merchandise, and more. If you’re going to declutter at the end of the year, you can write some contributions off on your taxes. Also, the benefits of decluttering in general can help you save money. Not only will you get rid of things you no longer want or need, but you’ll be reacquainted with some of the things you forgot you had. One thing I hate about a cluttered home is the fact that I can’t seem to find anything I need, and I end up running out to the store to buy something I may already have. If you’re trying to get rid of items like clothes, furniture, electronics, and toys, some local resale shops may even pay you for the items. Just like how volunteering allows you to give your time and support a cause you care about, you can also give your time and service to family and friends this holiday season instead of giving gifts. Instead of making it about “stuff”, give others a positive experience and quality time with you whether it’s helping your parents clean out their basement, donating blood to your friend’s favorite charity to save a life, shoveling snow for your grandparents, or baking a holiday treat for a neighbor who has shown you kindness throughout the year. Too often, we try to express our gratitude by purchasing things for other people that they honestly may not even like or want. Sure, a gift card can be nice, but if you can’t afford it or want to give something more meaningful, save your money and give your time and a service instead. If it’s on your heart to help and give back this holiday season, consider adopting a child in need by purchasing a Christmas gift for them. There are tons of charitable organizations that help provide Christmas gifts to kids in need by connecting them with sponsors who ‘adopt a child’ by purchasing something on their Christmas list. My husband and I did this last year through our church, and it made us feel great to help a family in need out. I know what it’s like to wonder how you’re going to get holiday gifts for your child, and it reminded me of the times when I wasn’t as financially stable. It reminds me that the holidays are about more than presents and money. It’s about making do with what you have, showing gratitude, and enjoying your loved ones. Adopting a child for Christmas last year cost us only $25, and we worked that into our budget and spent slightly less on ourselves. By lowering some of your holiday expenses and focusing more on giving, you can do this too, and make a difference in someone’s life without causing any financial stress for yourself. Naturally, when you focus on giving time, services, and assets other than money and presents, you will save big and feel better. If you are financially stressed out due to the holiday season and think it’s all about gifts, you’re sadly missing the bigger picture. Giving back not only help others, but it helps you as well, if not more. How will you be giving back this holiday season? Do you plan on trying any of these ideas?